Marijuana and other illicit drugs are addictive and unsafe especially for use by young people. As officials with the National Institute on Drug Abuse state, drug addiction is a progressive disease and the earlier one starts, the more likely are the chances of developing a substance use disorder. Marijuana contains chemicals that can change how the brain works. And the science, though still evolving in terms of long-term consequences of marijuana use, is clear: marijuana use is associated with addiction, respiratory and mental illness, poor motor performance, and cognitive impairment, among other negative effects. This is especially troubling since research suggests one-in-11 people who ever used marijuana will become dependent on it; this risk rises to one-in-six when use begins in adolescence. In 2009, marijuana was involved in 376,000 emergency department visits nationwide. According to the 2010 Monitoring the Future study, levels of current marijuana use among 8th, 10th, and 12th graders are the highest they have been in seven years. In 2010, daily marijuana use increased significantly compared to 2009 among all three grades surveyed – among high-school seniors, daily use rose from 5.2 percent in 2009 to 6.1 percent in 2010. Confusing messages about marijuana use that are being conveyed by proponents of “medical” marijuana perpetuate the false notion that marijuana use is harmless. These messages ignore the very real negative consequences associated with marijuana use and dependence. Given that 1 in 6 adolescents who initiate use of marijuana are at risk of developing an addiction to the drug at some time in their life, we owe it to them to make sure they understand and the people in their lives who care about them understand the real risks associated with its use. Marijuana itself is not an approved medicine under the Food and Drug Administration’s (FDA) scientific review process. Yet 16 states and the District of Columbia have permitted marijuana to be sold as “medicine” for various conditions. 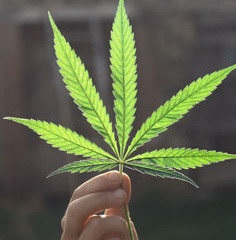 Although, some of the individual, orally-administered components of the cannabis plant (Dronabinol and Nabilone are two such drugs available today) have medical value, smoking marijuana is an inefficient and harmful method for delivering the constituent elements that have or may have medicinal value. The FDA process for approving medicine remains the only scientific and legally recognized procedure for bringing safe and effective medications to the American public. To date, the FDA has not found smoked marijuana to be either safe or effective medicine for any condition. This Administration joins major medical societies in supporting increased research into marijuana’s many components, delivered in a safe (non-smoked) manner, in the hopes that they can be available for medical professionals to legally prescribe if proven safe and effective. The U.S. Federal Government is the single largest funder of research on marijuana in the world. Furthermore, the Administration opposes drug legalization. Legalization threatens public health by increasing availability of drugs and undermining prevention activities. It also hinders recovery efforts and poses a significant health and safety risk to all Americans, especially our youth. Marijuana is a harmful drug and its use should be prevented and treated – not promoted. Outside the context of Federally approved research, the use and distribution of marijuana is prohibited in the United States.